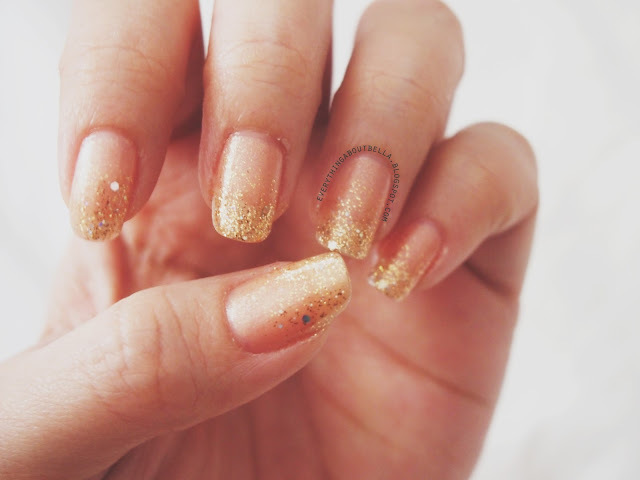 These are basically what I used to achieve the gold glitter gradient nails. For the base, I used Sally Hansen double duty base and top coat, and then I used one coat of the peachy shimmer polish from Etude House Juicy Cocktail set. Next, I used my Lovely Me:ex Base Coat from The Faceshop to give it a healthier and pinkier look. 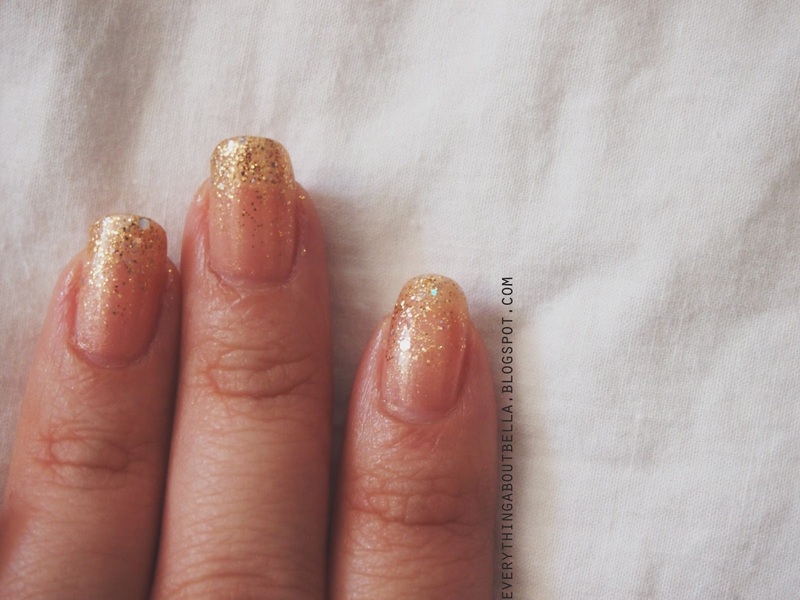 Then I did a gradient using the gold glitter polish from Juicy Cocktail #5 Princess Marry from Etude House. 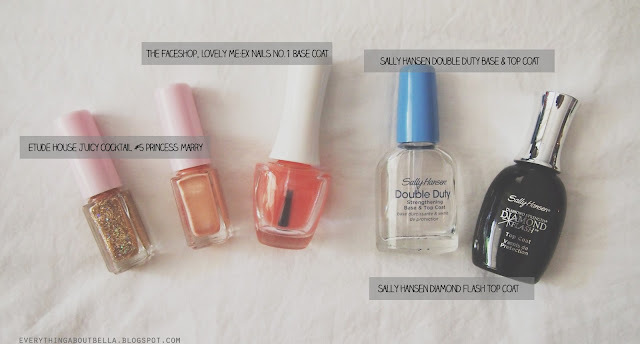 To finish it, I used Sally Hansen Diamond Flash Top Coat. 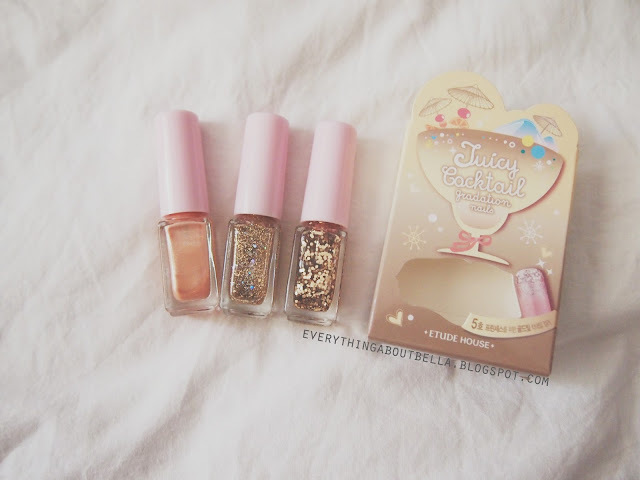 This is the complete set of the Juicy Cocktail #5 Princess Marry from Etude House. 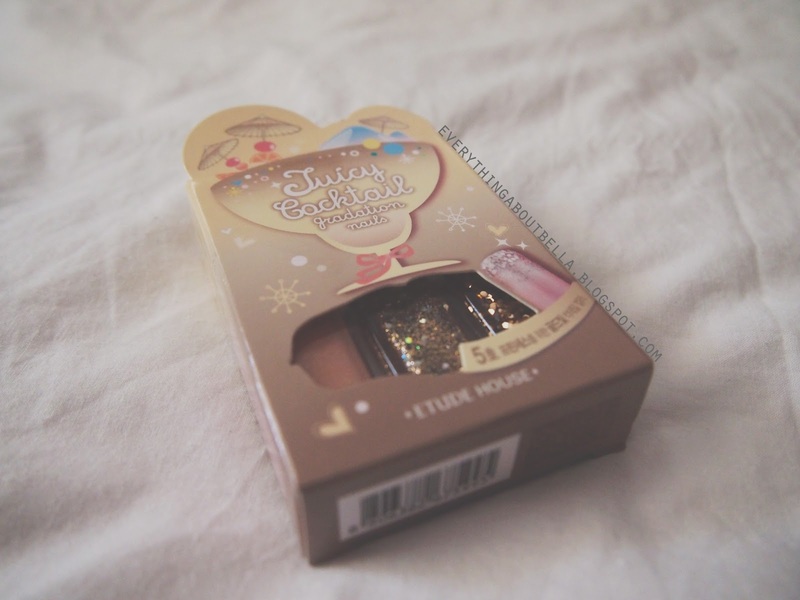 It consists of three amazing nail polishes which can definitely be used individually to create more varied look. I've been loving this set so much ever since I got it a month ago. For this look however, I did not use the bigger gold glitter as I wanted to create a softer glitter gradient nails, which does not attract that much attention. Here are some images of the nails. I am sorry if they do not show much detail as somehow my camera was not cooperative. Oh, and as the title says. This is my outfit of the day! 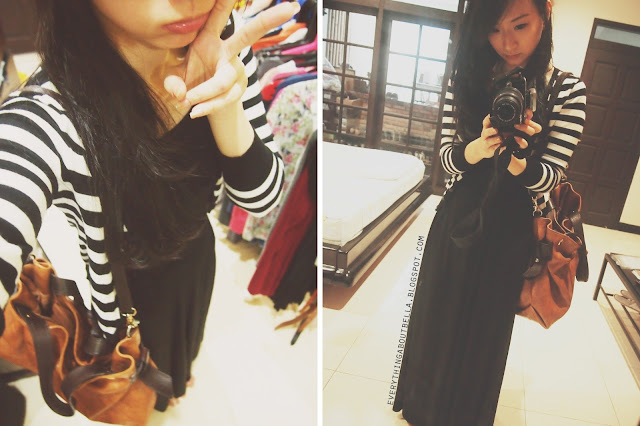 I wore a black tank top tucked into a black maxi skirt, black and white striped cardigan, a leather bag, and brown heels. Hello fellow Canadian :) Lovely blog! I love glittery ombre nails. I did a red sparkly one for Canada day~ ^-^ Looking forward to future posts! Hi! Thank you♥ I'm not Canadian though. I can't believe you did those nails yourself! They look so professional!! Noooo don't say that. They are not that good. Hi, You have a really nice blog. Would you want to follow each other on bloglovin and GFC? Yes sure! Followed you on bloglovin and GFC.. I love gradient glitter nails. I asked the nail lady in China to do mine like that when I went back haha. I wish I could do those myself ;___;!